Analysts who adopt the SDLC approach often benefit from productivity tools, called Computer-Aided Software Engineering (CASE) tools, that have been created explicitly to improve their routine work through the use of automated support. Analysts rely on CASE tools to increase productivity, communicate more effectively with users, and integrate the work that they do on the system from the beginning to the end of the life cycle. Visible Analyst (VA) is one example of a CASE tool that enables systems analysts to do graphical planning, analysis, and design in order to build complex client/server applications and databases. Visible Analyst and another software product called Microsoft Visio allow users to draw and modify diagrams easily. Analysts and users alike report that CASE tools afford them a means of communication about the system during its conceptualization. Through the use of automated support featuring onscreen output, clients can readily see how data flows and other system concepts are depicted, and they can then request corrections or changes that would have taken too much time with older tools. Some analysts distinguish between upper and lower CASE tools. 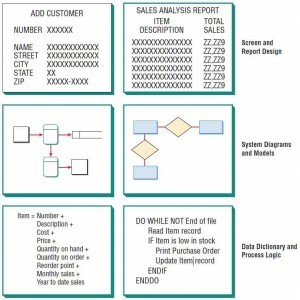 An upper CASE tool allows the analyst to create and modify the system design. All the information about the project is stored in an encyclopedia called the CASE repository, a large collection of records, elements, diagrams, screens, reports, and other information (see figure below). Analysis reports may be produced using the repository information to show where the design is incomplete or contains errors. Upper CASE tools can also help support the modeling of an organization’s functional requirements, assist analysts and users in drawing the boundaries for a given project, and help them visualize how the project meshes with other parts of the organization. Generated code is free of computer program errors.